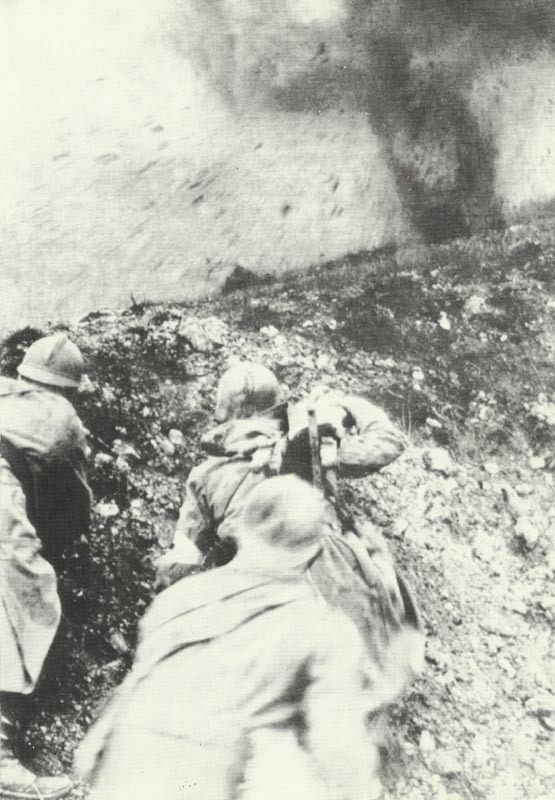 French medics trying to rescue a wounded in the heavy artillery of Verdun. Verdun: German attacks on French centre. Mesopotamia: Captured British general Townshend leaves Baghdad, reaches Mosul on May 19. Lake Tanganyika: Commander Spicer­-Simpson returns to Lukuga (left on February 21), soon rows with Belgians. Britain: Burbidge committee set up to inquire into alleged mismanagement of Royal Aircraft Factory, Farnborough. Chairman Sir R Burbidge, MD of Harreds store. Eastern France: German Lille deportation order grants 1 1/2 hours packing; 25,000 deported incl women and girls for farm work (until September). Ireland: Prime ministers Asquith’s surprise visit to Dublin (until May 18). Britain­: Home Office letter to JPs on juvenile crime rise.